In 2015 I started wearing false lashes more and more often. They make such a difference! Especially for hooded eyes. I think they weigh down the lid a bit more and make them look more open. Does that make sense or is it just me? I had seen many bloggers and people in general talk about mink lashes. They claim to be false lashes made from naturally shed mink hairs that can last up to 25 uses (which justifies their high price tag) vs. the typical 4 uses you get out of regular synthetic lashes. ESQIDO offered to send me my choice of three lashes from their collection. I accepted the offer, of course, because I had to try mink lashes for myself. I tried to select two “natural looking” pairs and a fuller, more dramatic pair. The styles I picked are Oh So Sweet, Unforgettable, and Lashlorette. The first thing I noticed upon receiving them was how beautifully packaged they were. The second thing that stood out to me was how soft they looked and felt. They definitely look very real. The price range for ESQIDO false eyelashes varies by volume (fullness). They start at $40 and go up to $50 per pair. + They look and feel incredible and very natural. 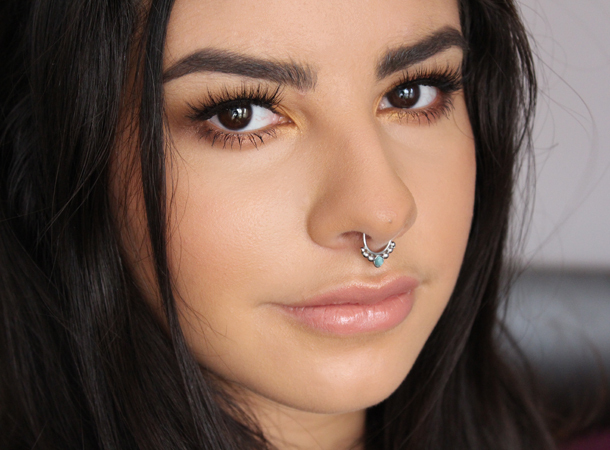 The visual difference between mink lashes and regular drugstore synthetic lashes is vast. + They are long (width-wise). I had to cut them shorter in order for them to fit my eye. This is something I usually never have to do with drugstore lashes. I have smallish eyes and I believe these will fit bigger/longer eye shapes very well. + A few stray hairs will shed when you clean them. + The band is very thick and dark. I didn’t find it too difficult to hide, but it made application a bit harder (compared to regular synthetic eyelashes). You could say these have a learning curve. + Even though they had different styles (criss-cross vs. straight hairs) and volumes (Lashlorette being the fullest and thickest style), they were all equally long (height-wise). I love this!! Sometimes you will purchase dramatic lashes because you want fullness and volume, but they also end up being very long. I find that really long falsies look somewhat costume-y (especially on smaller eyes like mine). + The thicker band makes for easier cleaning. Lash glue comes off in one fluid motion. + I haven’t worn these enough times to comment on the 25-uses claim. I assume they hold up better than regular synthetic lashes because of their thicker band. I definitely find that regular lashes start to look wonky after the third use. I have used all three ESQIDO pairs twice and they look as they did when I got them originally. Final thoughts: I think they are worth the investment if you wear lashes regularly. And if you do not, I think it would also be nice to get a pair that you really love. That way you won’t have to run out and purchase false lashes each one of those seldom times that you decide/need to wear some. Finally, the predominant quality of these mink lashes is their aesthetic look. They are very beautiful and will get you many compliments, every single time. Have you tried any mink lashes? What are your thoughts? wow these are looking so gorgeous !! Shamefully, I've yet to master putting on false lashes at all, let alone thick-banded ones! These are gorgeous on you though! Oh my, these are soooo damn gorgeous! When I have the budget I will find out how I can order a pair or two…or three of these! They are so natural looking yet so damn glam, it's exactly what we would love our natural lashes to look like but way better! My favorite pair is Lashlorette! Gosh, those eyelashes are just amazing. I don't use falsies everyday but those look like you could wear them everyday! these look absolutely beautiful on you. I still haven't been able to manage wearing falsies as I always think they look ridiculous on me and I cant get the application right, but these look so beautiful and fluttery. Wow – these look amazing on you! These are so pretty and so natural looking! I love them!